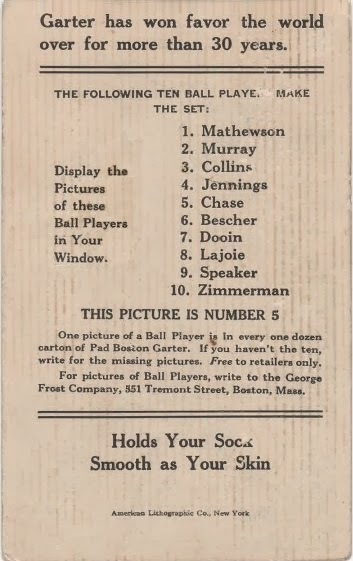 The last of three Boston Garter baseball sets released between 1912 and 1914 is an apparent step down from their larger, hand-colored issues, using no more than a sepia photo with small company logo and simulated autograph. I assume they cut budget for this particular promotion, but still wanted something for shop windows during baseball season. Actual size approx. 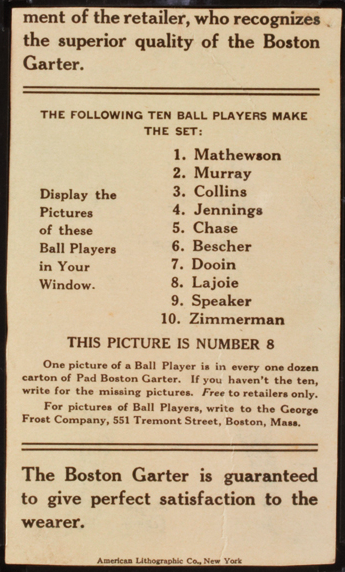 3 3/4" x 6 1/4"
Poor autograph cropping along the bottom edge implies Boston Garter reused this photo from another source, such as a team souvenir book, The Sporting News, or Spalding baseball guide. Chase's card doesn't claim a date or specify a team, but the photo's from his lengthy tenure in New York (1905-1913). No less than Babe Ruth called Hal Chase the best first baseman of all-time and his fielding prowess included aggressive positioning, confident in his quickness and ability to cover ground others couldn't reach (click through for a closer look). 1914's an interesting year to feature Prince Hal on a card, as he made a midseason jump from the White Sox to Buffalo's new, "outlaw" Federal League team. His career stats show the split, half with Chicago and half with the "Buf-Feds." Why Buf-Feds? 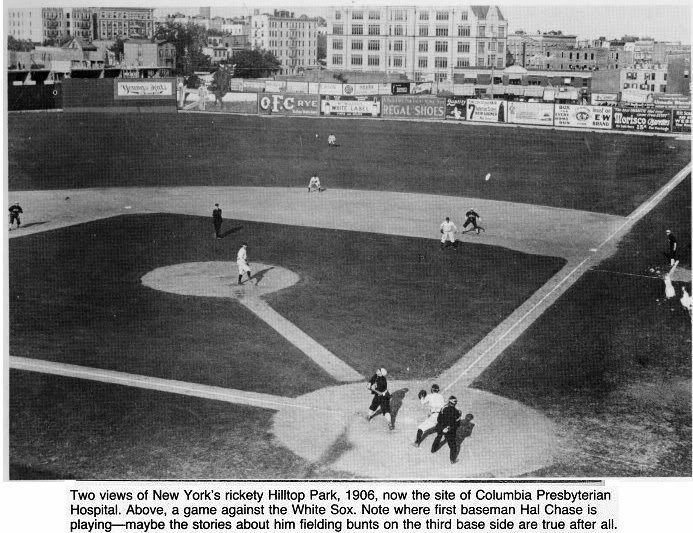 Prior to the 1920s, news writers and fans of that era often called teams by city and league affiliation (e.g., "Chicago Americans" instead of "Chicago White Sox"). National, American, Federal, and other pro leagues competed fiercely for fans in that era, so tried to craft allegiances along both geographical and organizational lines. 1914's just 10 years after John McGraw refused to let his New York Giants play the American League champs in what would've been the second modern World Series, so an undercurrent of NL vs. AL remained; NL and AL vs. Feds was just the latest permutation on a recurring theme. 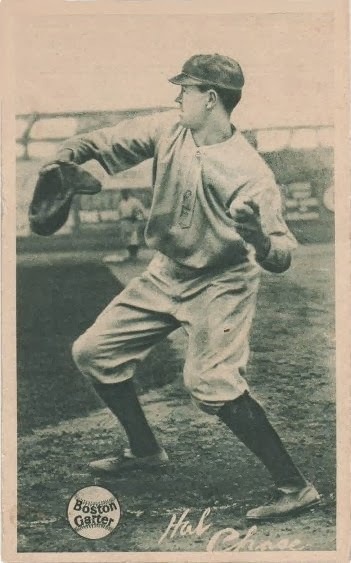 Different tag lines ("Garter has won favor..." & "Holds Your Sock...") appeared on different cards, with parts of another shown on this scan of #8 Nap Lajoie. Most agree the "best" Boston Garter is 1912's hand-painted set, with their earlier 1914 hand-colored photos as runner-up. Finding this Hal Chase would be a feather in my cap as a collector, but it's not as cool as those predecessors. Value: Legendary Auctions sold an SGC authenticated Hal Chase for $4200 in 2009. Hall of Famers Nap Lajoie, Tris Speaker, and Christy Mathewson would easily cost $10K and up. Fakes / reprints: Haven't seen any in the marketplace and it'd be hard to move a fake today, as most things this rare end up professionally graded and sell via auction houses. $4200.00 !! Are you trying to say you don't actually own this ? !! !